Marriage is one of God's most beautiful gifts and is intended to bless us, fulfill us, and give us a path to sanctity. Understanding what true love entails and how grace works to overcome our wounded human nature is the key to a holy, happy, and passionate marriage. In this six-session Bible study, popular author and speaker Mark Hart and his wife, Melanie, help couples understand key Scripture passages that illuminate the truths about married love and the "two becoming one flesh" (see Genesis 2:24). By undertaking this study, couples will grow in their understanding of sacramental marriage so they can reflect God's plan and glory and become a witness for Christ's sacrificial love for each of us. • "In the Spotlight" sections feature passages from important Church documents, quotes from the saints, and real-life witnesses. "Don't we all desire to have intimacy with our spouse and our God? This Bible study is a treasure and a roadmap, leading you and your spouse to intimacy and to heaven." "Embracing God's Plan for Marriage gives couples the opportunity to reflect on what is most essential in their marriage—and how divine grace can be part of their everyday life together. 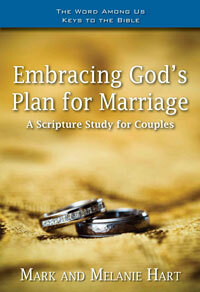 For both newlyweds and those married for many years, this Bible study is an engaging means of growing in holiness." 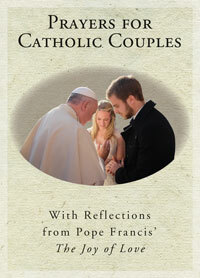 Read what Lisa Hendy with CatholicMom.com says about this book.